The only Fr. 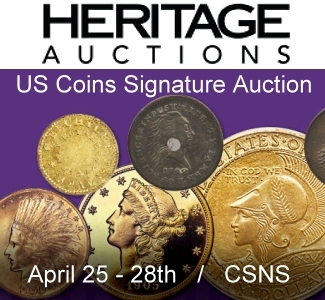 1215d $500 1882 Federal Reserve Gold Certificate known to exist other than a specimen in the public collection at the Smithsonian Institution is expected to bring $2+ million in Heritage Auctions’ Florida United Numismatists Currency Signature Auction Jan. 8-10 and Jan. 13 in Orlando, Fla. 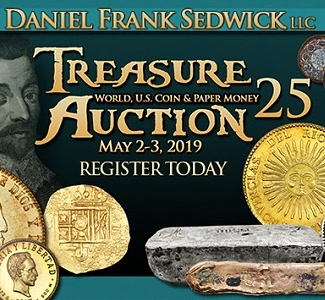 It comes from the estate of a turn of the century banker and includes three other incredible Gold Certificate rarities. The auction includes some of the rarest notes in private hands, including the precious Fr. 379b $1,000 1890 Treasure Note, popularly referred to as the Small Seal Grand Watermelon note, which is also expected to change hands for $2+ million. 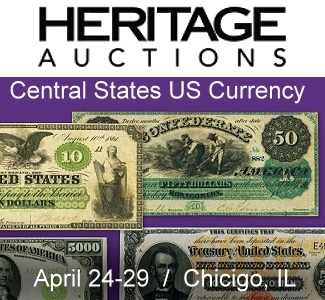 The 2014 FUN auction comes nine months after a Heritage set a world record for a U.S. banknote as a $1,000 1891 Treasury Note brought a record $2.58+ million in April in Schaumburg, Ill. 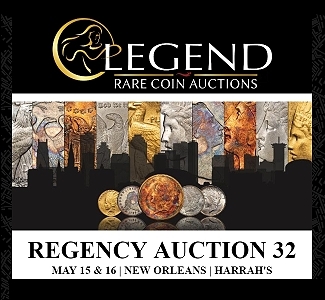 This year’s event kicks off with a 200-lot Platinum Night Auction presenting some of the world’s rarest notes, including a Fr. 1218d $1,000 1882 Gold Certificate. Referred to as a Large Brown Spiked Seal note, the specimen is one of four known, with two in private hands. Prior to the discovery, only three examples were known to exist and as such the rare note has been estimated to sell for $1+ million. A second 1882 Gold Certificate, a Fr. 1218e $1,000 note, is one of four known and likely unique in private hands. The appearance of the note raises the census from three to four with two of the three previously known notes residing in the Federal Reserve Bank of San Francisco and in the Federal Reserve Bank of Chicago. The piece offers bright white paper and fresh ink colors on both sides, which has set its pre-auction estimate at $1+ million. A stunning Fr. 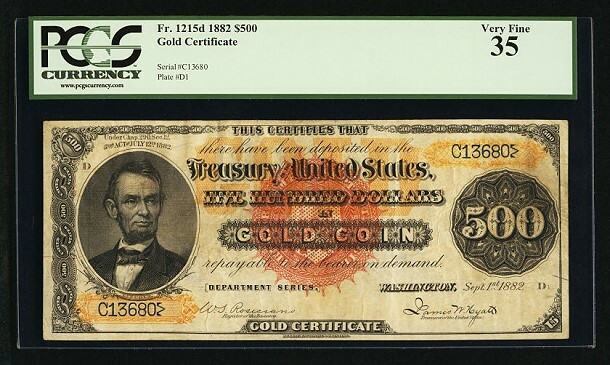 1202a $100 1882 Gold Certificate is a unique discovery and likely the only one of its kind in collectors’ hands. 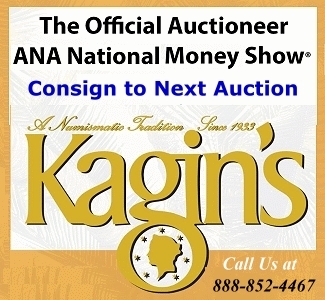 The unique, small brown seal, triple signature $100 has the appearance, color, and eye appeal of a high end extra fine note and as such is expected to sell for $700,000+. A unique Fr. 11a $20 1861 Demand Note dates to a period when such notes were hand-signed by Treasury clerks. Clerks once added the words “for the” following their signatures and finds such as these are scarce additions to Demand Note collections. The ‘irreplaceable’ note is estimated to sell for $600,000+. Among the most highly anticipated lots is a Fr. 377 $100 1890 Treasury Note, popularly referred to as a “Baby Watermelon Note.” This coveted specimen is one of just 35 examples known to exist with a great majority of examples in much lower condition and is expected to break $250,000+. Platinum night is not limited to epic Large Size rarities. One of the most fascinating pieces we’re featuring is a Solid Serial Number Zero $1 Federal Reserve Note. The note tells a story of how these pieces were numbered at the Bureau of Engraving and Printing, but in this case, it may be the only known example to feature the solid zero serial number to appear at auction. The $60,000 to $90,000 estimate is simply an educated guess. 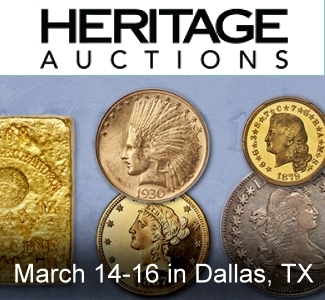 We also expect some enthusiastic bidding for a new to the census and wholly original 1934 Dallas $5000 which is estimated at $80,000 to $100,000. Spectacular National Bank Note discoveries are also a part of this incredible event. The rarities span rare locales across the United States from Zillah, Washington to Key West, Florida. A Series 1902 note from South San Francisco turned up. It’s the first time California collectors have seen a note from this locale, one of the last highly coveted and previously unknown locations from the state. It carries a pre-auction estimate of $25,000-$35,000. From Mississippi, a Serial Number 1 Red Seal from Clarksdale is another unlikely survivor from a previously unknown bank. To date, just one other Serial Number Red Seal has been offered at auction from the state, making it a rarity that will appeal to more than just Mississippi collectors. It would not be a surprise to see a realization above its $30,000-$50,000 estimate range. 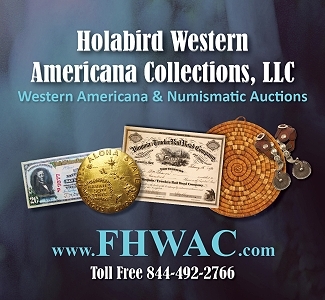 Previous article2013 Coin Market – A Banner Year For Numismatics!